About two years ago a young woman arrived in my life and irrevocably altered it. For the past two years, I have watched this young woman grow from strength to strength. She went back to school to acquire skills to help her understand and combat systemic oppression. She spends most of her energy in community activism and organizing. 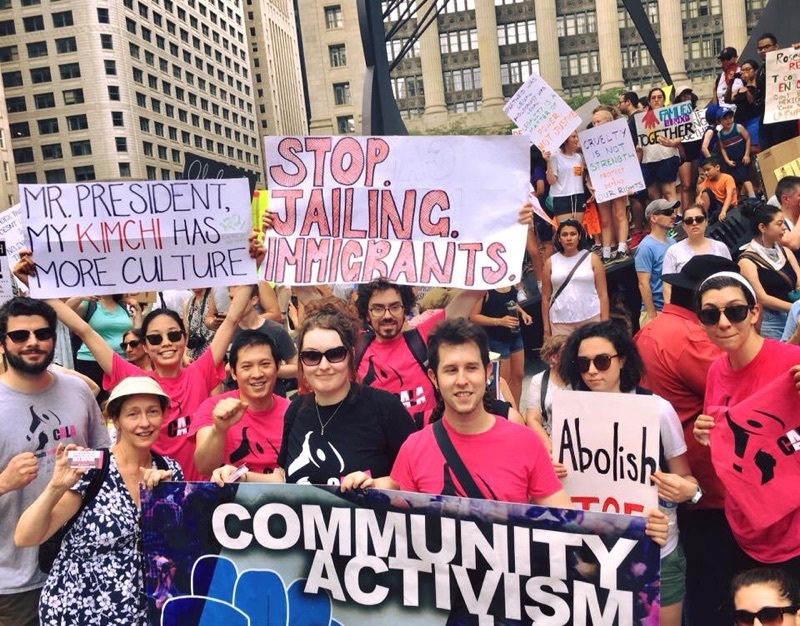 She serves as secretary and grant-writer for the board of the Community Activism Law Alliance of Chicago (CALA), an award-winning organization that brings lawyers and activists together to offer free legal services to marginalized individuals and communities. 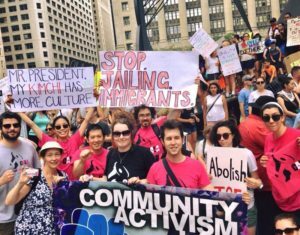 CALA fights for workers, for victims of sexual and domestic violence, for immigrants of all kinds. CALA offers free workshops and free legal representation, advice, training, and pro bono support to those who are not simply underserved, but utterly isolated. Dream Riders cheering each other on with Serafina Ha in the most amazing green pants I have ever seen. 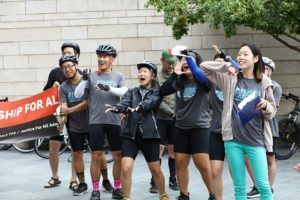 She also brings her indefatigable spirit to her work as a community leader, filmmaker, interviewer and publicist for NAKASEC, the National Korean American Service & Education Consortium, a grassroots organization working on behalf – especially – of Asian immigrants. 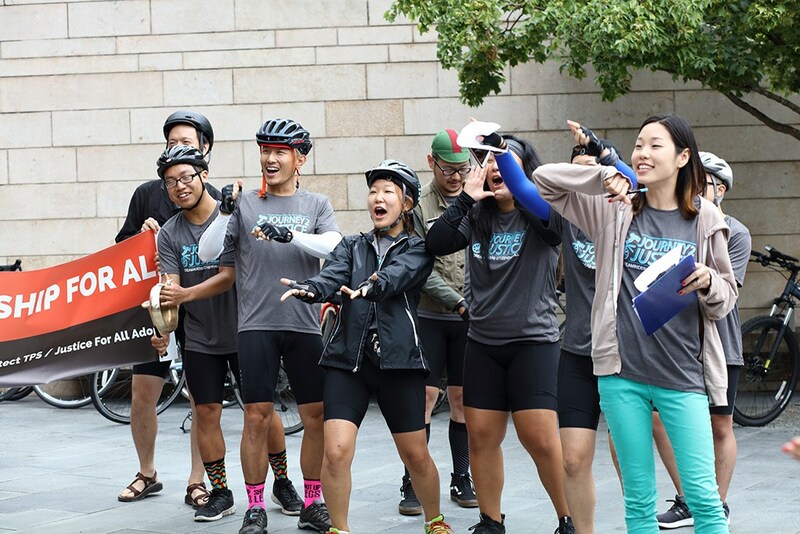 This past summer, NAKASEC has been sending its young people out to demonstrate, to speak, to bike for more than a month across the west coast to help make the gifts and hopes of immigrants real for those willing to hear their voices. She listens to the stories of those who have been hurt and harmed; she imagines any way she can to help heal and free those she serves. And then she builds those ways and makes them concrete. If you love a musical instrument you own, you do not want it baking in a car or freezing in the hold of an airplane. I needed a guitar I could travel with – for teaching and for leading services. But the guitar I wanted was – at least for me – a rather expensive endeavor. For good reason: it was made with an inventive technology that allowed its owner to take its neck from its body and pack it up into a package so neatly that it could be placed in an overhead bin on an airplane. I listened to the demos of guitar players far more skilled than I on and off for many months. I put aside money. Finally, I contacted James Brawner, owner and partner at Journey Instruments to think through my options. We talked about the guitars, music-making, even a bit about what we were doing with our lives. Just a day or two before the guitar was about to arrive, James wrote me an email. He had received a note about the guitar indicating that it had suffered some small nicking on the wood near its neck. But I was leaving on a trip for which I really needed the guitar for a service I was leading. I wasn’t sure what to do – send it back? Take it anyway? I grew up in a world of broken things. Having a newly-made guitar arrive in even a slightly damaged state triggered unhappy memories. I called James and confessed my uncertainty. He generously told me to take the guitar on the trip and pray with it. We would work it out when I got back. I took the little guitar to ALEPH’s 2018 smicha week, where I was teaching. Then she helped me lead Kabbalat Shabbat services. I returned from my trip and called James. I was still uncertain, still fighting the childhood memories of having things harmed and broken, of knowing harm and hurt. I could send the guitar back, James said. He could also offer me a discount if I decided to keep her. I explained. I had prayed with that guitar. After all, I said, all of us have been harmed and hurt and even broken. I wanted the discount not because I needed it, but because I wanted to give it to organizations offering hope and strength and help to those who have been harmed and hurt and broken. My little guitar wasn’t perfectly whole, but, in the end, her small hurts could be the agency of healing. James was so delighted that he told me he would match the money he was sending to me and give it to organizations he loved. I got the discount last week. Today I added a little money to the discount so I could round it up. Then, I sent half to CALA and half to NAKASEK. In honor of the young woman who walked into my life two years ago in Grant Park, Chicago. In support for the work she does. In the name of those she serves. This blog post is dedicated to Serafina Ha.